1. Preheat the grill to high. In a small saucepan heat the vinegar on the hob until it comes to the boil. Remove from the heat. Add the onion, season and leave to cool completely. When ready to eat, drain well. 2. Place the salmon, skin side up on a foil-lined tray and grill for 5-6 minutes. Mix together 1 tbsp of the spicy rub and all of the tabasco. Turn the salmon over and spread the paste over the flesh, grill for a further 8-9 minutes or until cooked throughout. Cover with foil and leave to rest for 5 minutes. Remove the skin and break into large chunks. 3. Mix the yogurt with half the coriander and the remaining spice mix. Heat the beans through in the microwave or in a small pan over a high heat until piping hot. 4. 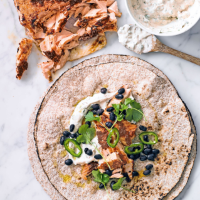 Spoon a little yogurt onto the tortillas, top with beans, then the fish, pickled onion, chilli and remaining coriander. Fold in half to eat.